Shortly after this white rhino baby was born in South Africa, she’d find herself orphaned, alone and facing the near impossible. The animal was still tiny and unequipped for the wild, yet she had been left to fend for herself—exposed to predators and lacking the skills to find adequate food. Even as adults, white rhinos thrive in groups, and solitude is inherently dangerous for the species’ young—especially in the critical period after birth. 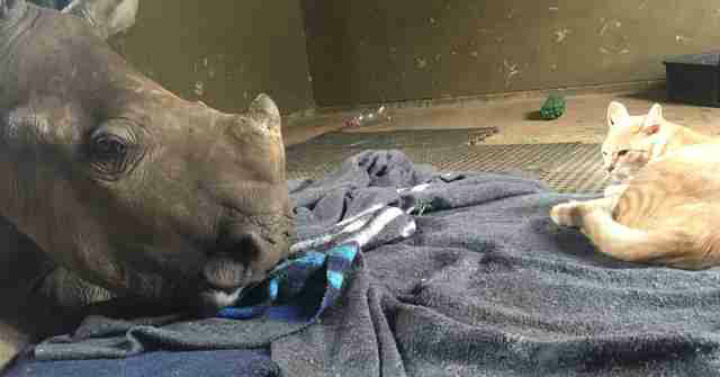 This lone little rhino’s chances of survival were almost nonexistent, not to mention short of a miracle. Just in the nick of time, though, external forces would intervene. 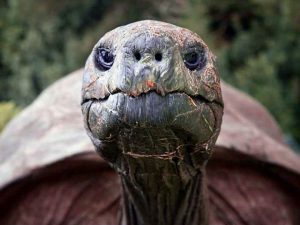 And while her road to recovery would be long and full of difficulties, she’d eventually form an incredible bond with some unlikely friends who would possible help her persevere for another chance at life. 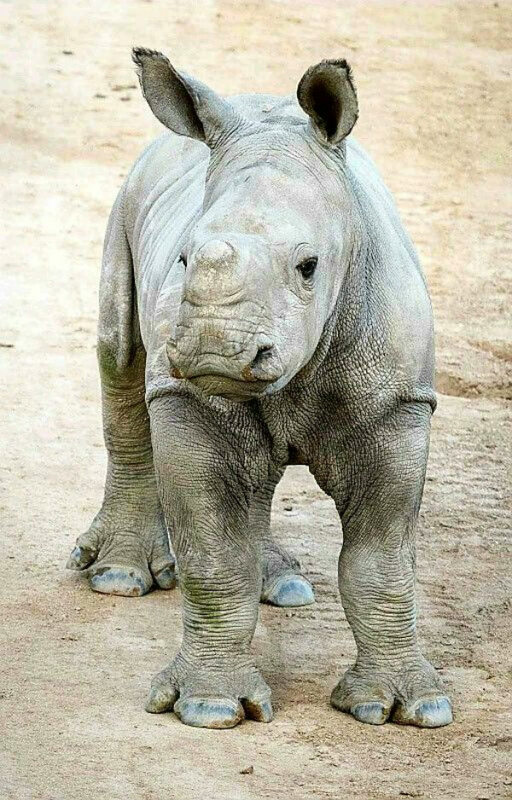 When a white rhino calf named Nandi was four months old, she was tragically left orphaned due to poachers in South Africa. 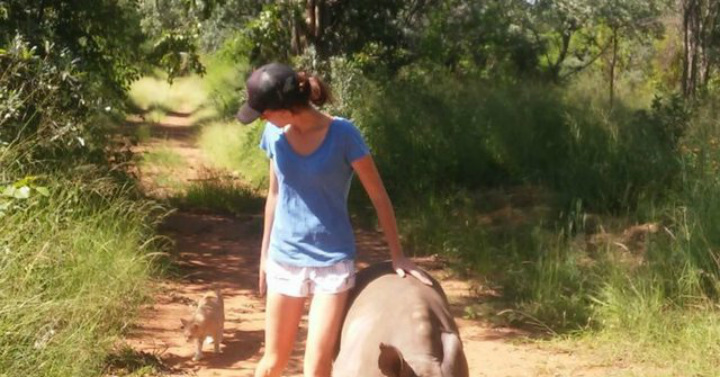 The perpetrators took her mother’s life but happened to leave the young rhino alive. Although Nandi had made it through the traumatic incident, she was then be forced to fend for herself, all alone in the wild. Her chances for survival in such a situation were slim to none. But the will to live was strong in Nandi, and she wasn’t going to give up just yet. The lone little rhino would try her luck in the wild and trek through the sub-Saharan summer all by herself. 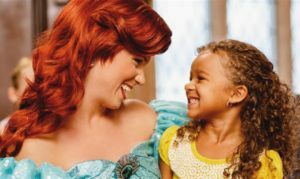 Whether she’d make it through wasn’t clear, but she’d forge several adorable, yet unexpected, friendships along the way that would be priceless. It wasn’t easy for Nandi to get along in the wild without her mother—finding food was a particular challenge. But there was another-potentially more urgent-threat that loomed large, and Nandi wasn’t even aware of it. All over the South African countryside, hungry predators lurked about. As a baby rhino, she was an easy target. Although adult white rhinos have no other natural predators other than humans, young rhinos are always at risk when they’re away from their herd. Hungry lions and hyenas looking for vulnerable prey would have been able to pick Nandi off easy. Time was running out for the young rhinoceros. If she didn’t get help soon, she’d be in big trouble. It was only a few days after Nandi lost her mother, but it must have seemed like an eternity for the wandering little calf. White rhinos get most of their sustenance by grazing on grass, which they find by walking with their heads down and squared lips lowered to the ground. 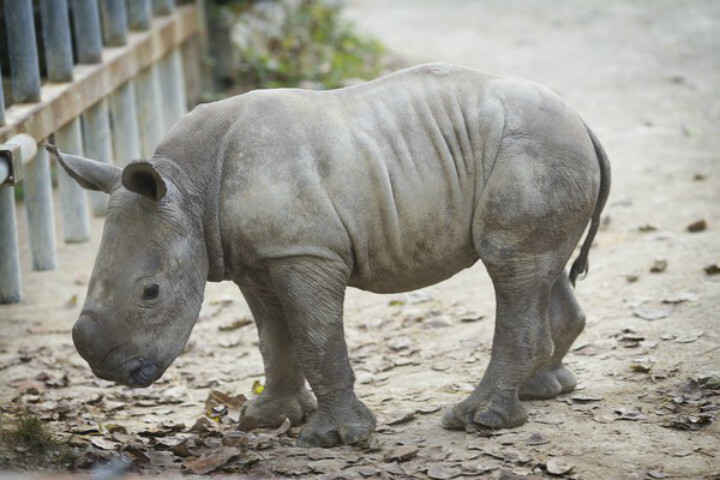 It’s a skill rhinos learn from their parents at two months of age. Still, at only four months old, Nandi was accustomed to her mother leading the way and finding the food. Rhino calves are meant to remain with their mothers for at least the first two years of their lives. The state of panic that can accompany losing a mother surely only made it harder to focus. The unfortunate situation would grow increasingly difficult before little Nandi’s luck would take a miraculous turn. For a baby rhino who wasn’t used to finding food alone in the hot African sun, grazing was easier said than done. 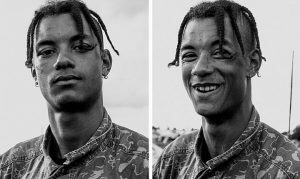 It was December in South Africa – the the dead of summer in the Southern Hemisphere. And that’s exactly when Nandi had been left alone and exposed in the wilderness. 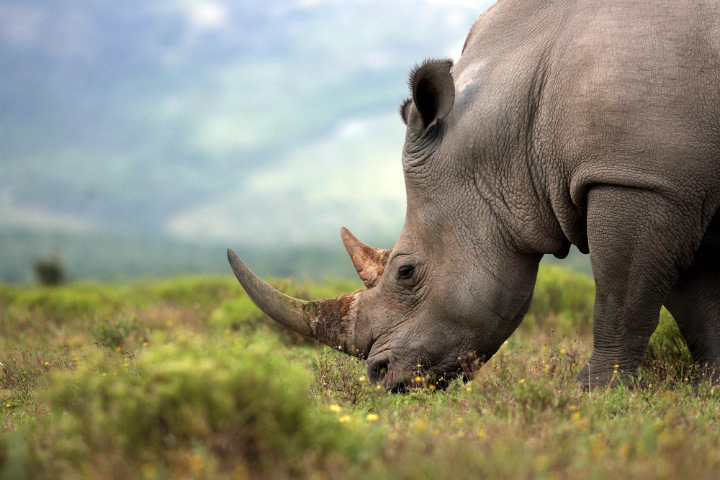 Depending on the specific area within South Africa, food isn’t always so abundant for rhinos. Some areas are dryer than others, resulting in less available grass, shrubbery and fruit for feeding. Perhaps even more troubling, it can be a challenge for a young rhino to find water, too. For Nandi, desperate times called for desperate measures. When the starvation really set in, the scared little rhino became desperate. Nandi purportedly became so hungry and unable to find sustenance at one point that she began eating the sand on which she stood. Unfortunately, ingesting sand is very harmful for rhinos. The poor animal was simply running out of options. The lack of food was beginning to physically affect Nandi. She started to bruise easier without access to proper nutrients, and she also became alarmingly thin. She couldn’t survive much longer, and to make matters worse, she was too weak and too young to fend off anyone or anything that might pose a threat. Nandi desperately needed a bout of good luck, and soon. Just when Nandi was about to succumb to her exhaustion and extreme hunger, someone approached her. It was a human again. Considering the last human she saw was a poacher, the vulnerable rhino must have been mortified as the figure towered over her. Luckily for her, though, this person was one of the good guys. 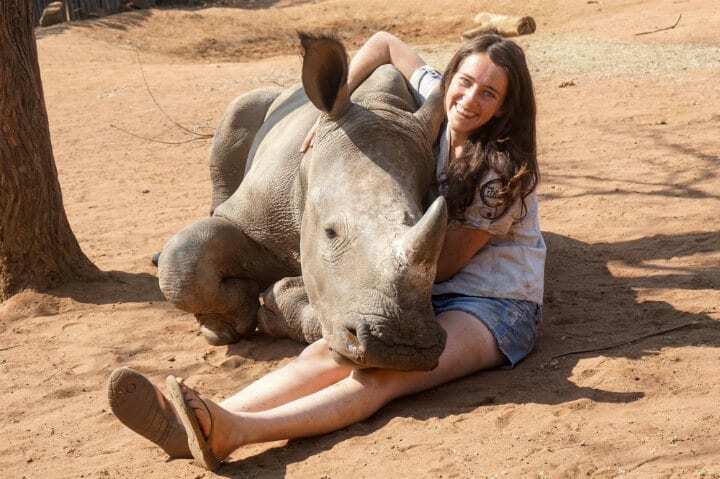 The approaching human turned out to be a rhino rescuer from The Rhino Orphanage in South Africa’s Limpopo province. It was Nandi’s knight in shining armor, even if she didn’t know it yet! The rescuer had to act with haste, though, or it would be too late for the powerless little white rhino. 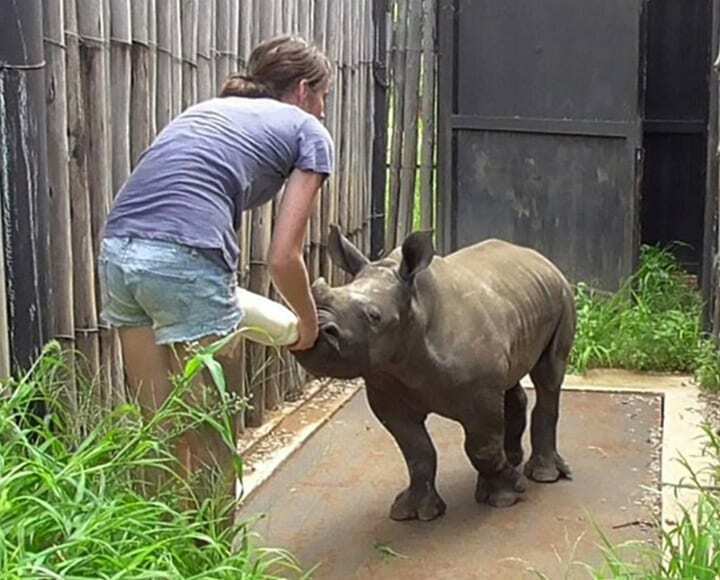 The rhino rescuer was glad to get to Nandi before any other bad actors found her. It was clear the rhino was almost ready to give up her fight. 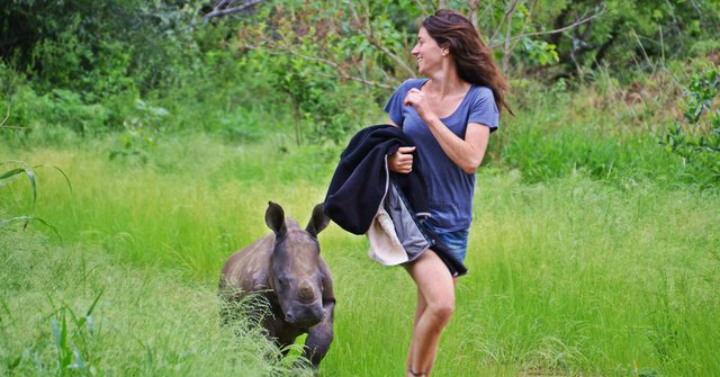 The rescuer had to be careful approaching considering Nandi was, after all, a wild animal. Nonetheless, immediate action was necessary here. The rhino was clearly losing her strength, and rapidly. Quickly, the Orphanage worker loaded Nandi on board the rescue vehicle and rushed the beaten-down rhino back to Limpopo’s Rhino Orphanage. Nandi was hanging on for dear life the whole ride back. 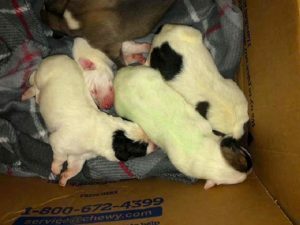 No one could have foreseen the ordeal would soon lead to another life-changing development for the animal. When Nandi arrived at the orphanage, the crew, led by orphanage manager Jamie Traynor, could tell the orphaned rhino calf was clearly malnourished. They fed her milk, which she drank “straight away,” according to the Wild Heart Wildlife Foundation – an organization that supports the orphanage. It was important that Nandi drank the milk to regain her strength. According to the animal sanctuary, rhino milk is more packed with carbs, and lower in fat, than the milk of other hoof stock. 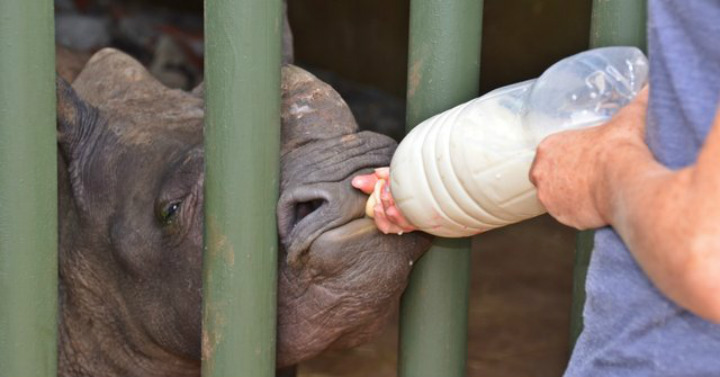 It was the energy boost that the milk provided that helped Nandi in her initial steps of survival. She wasn’t in the clear yet, though. 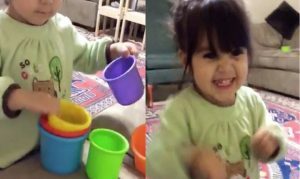 While feeding her, the caretakers at the orphanage noticed something wasn’t right. Shortly after Jamie and her crew began feeding Nandi, they inspected the rhino for any kind of physical trauma. That’s when they noticed that something seemed off about the young rhino while she was would drink her milk. It’s completely expected that a calf stranded by herself would have sustained some injuries, but the crew had to figure out exactly what was the cause of her pain so they could help. It was then that they discovered Nandi’s intestines were damaged from the sand she had consumed when she couldn’t find any actual food out in the wild. The crew had to do something about it before Nandi could begin her recovery process. But extreme measures were needed. 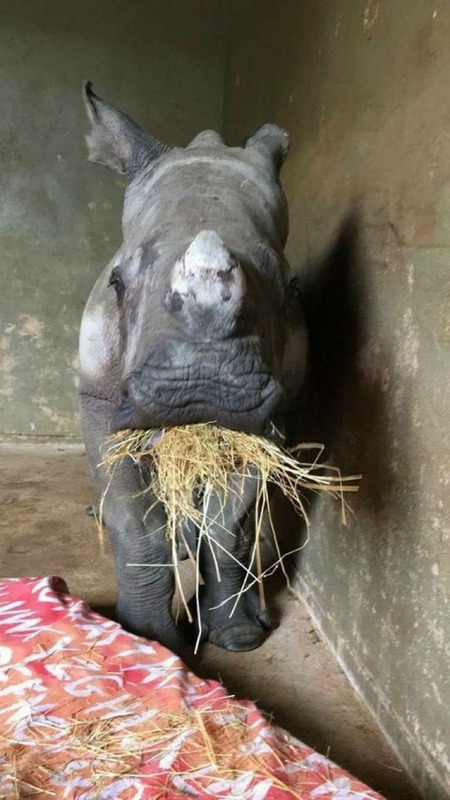 Before Nandi could even begin to be rehabilitated from the time she endured in the wild by herself, the rhino conservation crew had to arrange for a surgery on her intestines. While other animals wouldn’t necessarily have been able to endure such an ordeal, rhinos are well endowed in the digestive department. 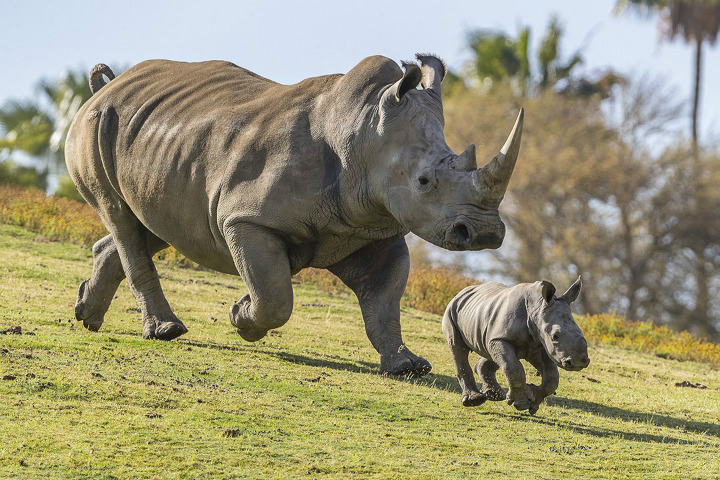 The intestinal organs of the rhinoceros are extremely large compared to those of other land mammals, and that sometimes increases their chances of survival when food is scarce. It seems rather likely that, in this case, Nandi’s powerful digestive system would work in her advantage. Still, not all rhinos who make it to the orphanage are able to be saved. Would Nandi make it through? As terrified as she appeared when rescuers first reached her, Nandi proved to be quite the little fighter. The surgery ultimately succeeded, and Nandi was now truly on the road to recovery. The more milk she drank, the fuller she became. Her bruises began to disappear too! 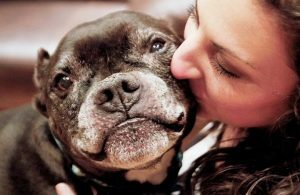 Throughout Nandi’s recovery, Jamie never left her side. The rhino was still scared and confused, likely wondering who the people surrounded her were, but Jamie sat by her side with the hope of making her understand the rescuers were there to help her. Soon, Nandi would meet another unlikely friend who’d help her on the path to recuperation. Since the moment Nandi arrived at the orphanage, Jamie carefully monitored her every move to make sure everything ran smoothly and she could begin to recover. 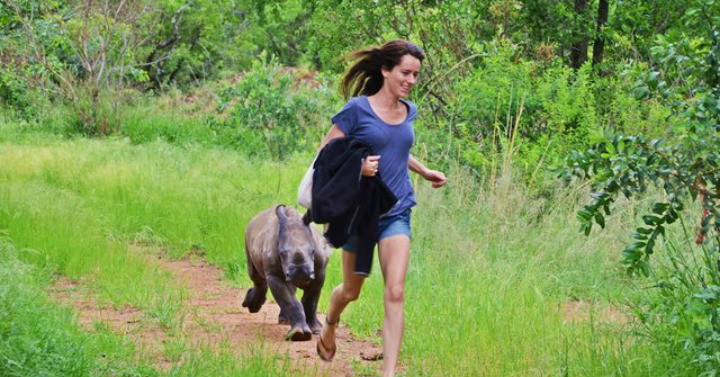 The rhino was timid at first, but she became slightly more friendly as she regained her energy. It was almost as though she could tell Jamie had saved her life. Rhinos aren’t quite known for being as friendly as, say, dogs are with humans. But, little by little, it seemed like Nandi was becoming more relaxed around Jamie. Not only was she generally more at ease, but she would even let Jamie pet her! 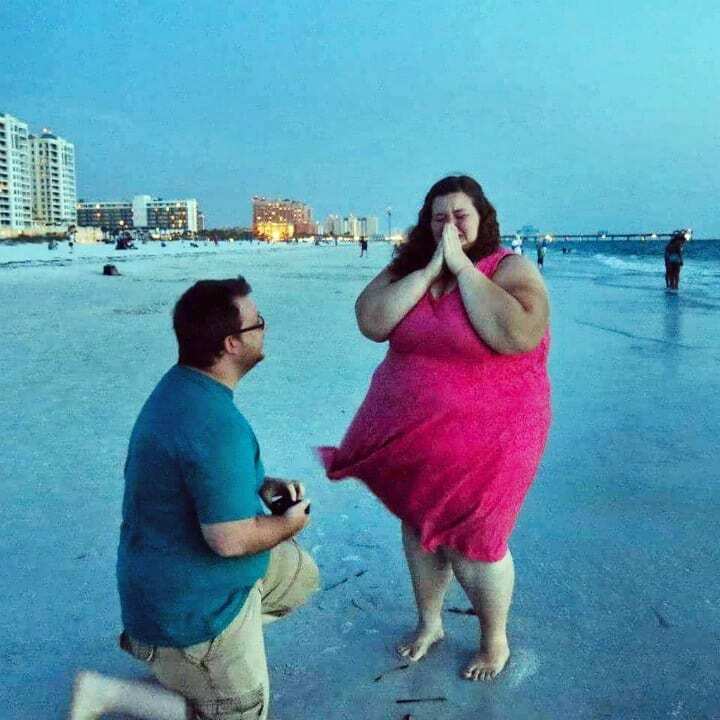 What would happen next was simply stunning. It seemed Nandi was still skeptical of humans as a result of her initial encounter with poachers, but Jamie seemed to be the exception to the rule. Soon, Nandi’s bond with her caretaker would lead her to meet a new friend—one that isn’t necessarily expected for a rhino to have. 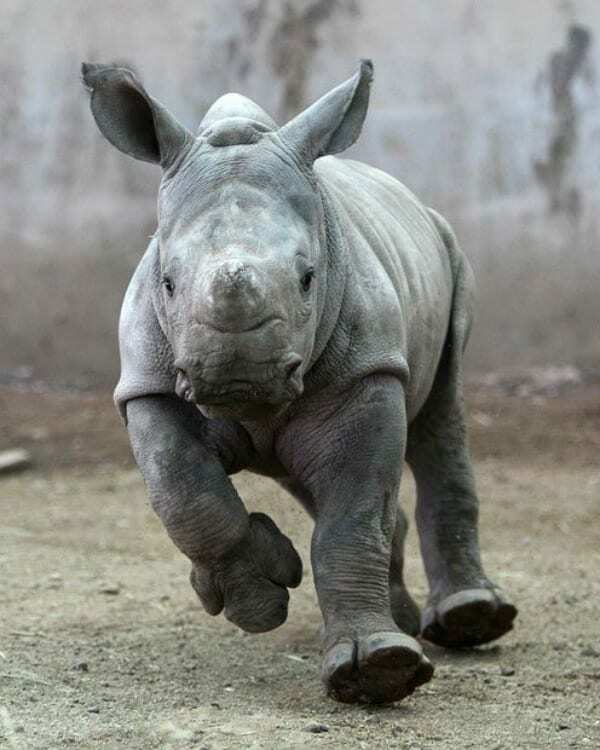 After a few weeks passed in the rhino sanctuary, and the terrified little orphan grew into an exuberant (yet, still little) rhino. Nandi actually began following Jaime around everywhere she went. Her wounds, not just physical, also began to heal. Her playful attitude and energy-filled days attested to her recovery, as she and Jamie went on daily walks together. “Luckily, in Nandi’s case, it seems as if the adorable baby is out of the woods,” WHWF wrote in a Facebook update at the time. “She is drinking well, starting to eat solids and her health is improving day by day.” Jamie and her crew had apparently done their job well. Soon however, another someone joined Jamie and Nandi on their walk and things would again change. As Nandi reveled in her daily walks around the orphanage with Jamie, someone else began following the two around—someone much smaller and far furrier. It was white-and-ginger tom cat named Mewie, who had also been rescued by Jamie and the crew. Mewie appeared totally unfazed by the much larger rhinoceros. Of course, cats are natural predators and aren’t always intimidated by larger animals. But it wasn’t only that Mewie was unafraid of Nandi, it was that he seemed to take a liking to the comparatively enormous animal. 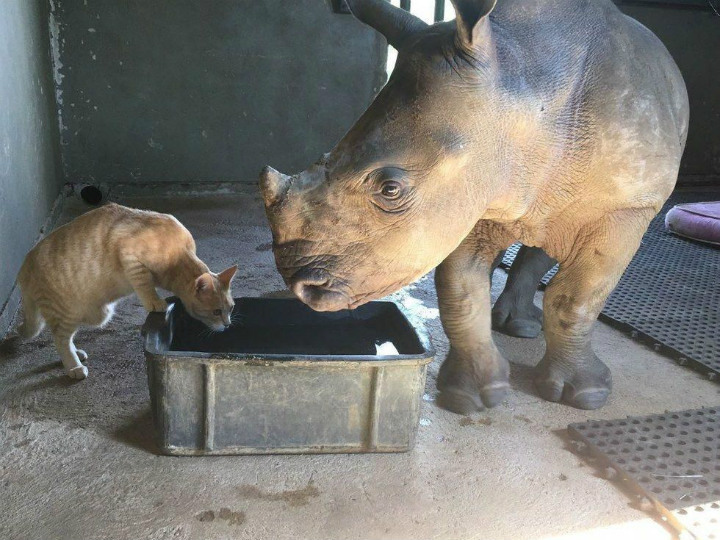 But how the super skeptical baby rhino reacted to her new feline compatriot was nothing less than extraordinary. Jamie might have been surprised to discover Nandi didn’t actually mind Mewie’s presence. 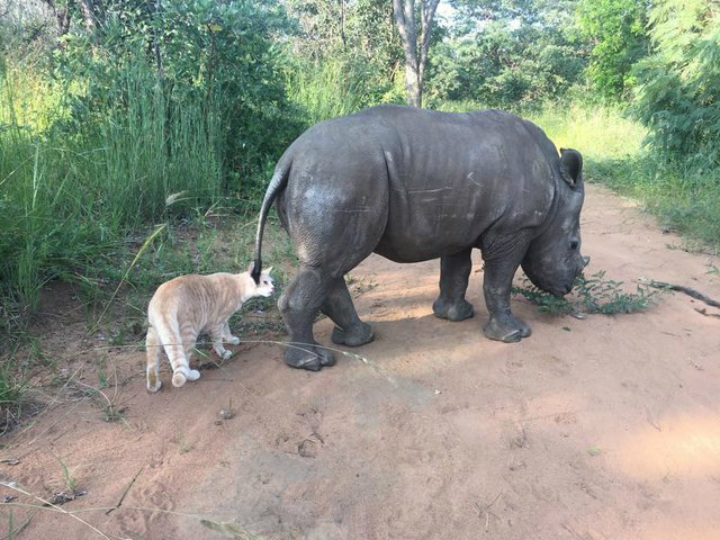 The cat was determined to take the newly-saved rhino under his wing—or, rather, his paw. Everywhere Jaime and Nandy went around the orphanage, Mewie followed suit. 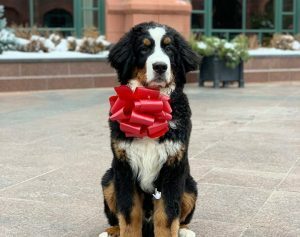 “They get along pretty well because they both love to go for walks and then come back home and take a nap,” Jamie said after the initial encounter of the unlikely duo. “Mewie needs to be carried back from the walks because he gets too tired,” their caretaker added. Too tired, or too lazy? Either way, it was clear that even when they returned from their long walks, Mewie couldn’t stay away from his giant lady friend. But their adorable bond didn’t end there. When Nandi and Mewie returned from their walks, Jamie would take the rhino and cat pair to rest during daily joint naps. It was a critical part of the recovery process, for Mewie too. Jamie had rescued the cuddly cat when he was only a few weeks old. In fact, Mewie wasn’t the only feline residing at the orphanage at the time, though he certainly was the most attentive. One day, Mewie simply decided to join Nandi in bed. Even during nap time, Mewie didn’t want to leave his new friend’s side! While this precious pair pulled the heartstrings of the sanctuary’s staff, it turned out that Nandi was quite popular around the orphanage, and Mewie wasn’t her only friend. Eventually, Nandi and Mewie became so inseparable that other animals around the orphanage apparently began to take notice of their friendship. And, let’s be honest, how could they not? The unlikely cross-species bond was so adorable and it seemed that other recuperating animal in need of support and company wanted a part of the action. 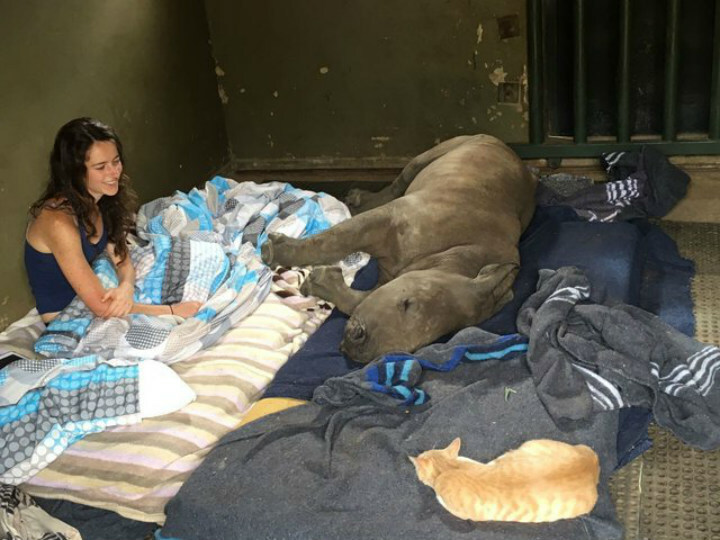 In addition to Mewie, Nandi befriended another young rhino at the orphanage named Neni! One can only hope Mewie didn’t get too jealous. Despite getting a difficult start in life, Nandi proved at the orphanage that she had a high propensity for friendship. But as she began to near the last stretch of her journey to recovery, the sanctuary staff was considering plans for her future that could involve another drastic shift in her routine. The purpose of The Rhino Orphanage in South Africa is to help rehabilitate wounded rhinos so they can eventually be returned to the wild. 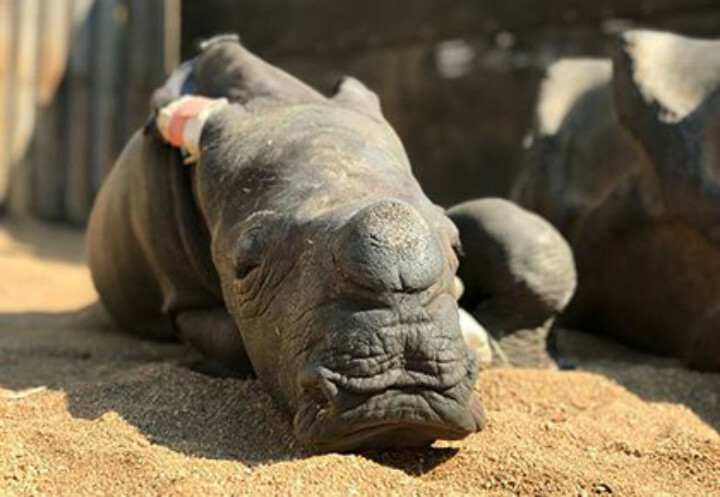 But with Nandi’s severe trauma and damaged intestines, Jamie and the crew weren’t sure whether the little rhino would ever be able to be strong enough to be released from the orphanage. Not all the rhinos that arrive at the shelter are able to be saved, and others are too weak to be released into the wild. But thanks in large to Jamie and Mewie, Nandi’s progress was nothing short of miraculous. What happened next would once again change her daily reality in an extraordinary way. In June 2018, after about a year and a half at the orphanage, Jamie and the crew were convinced that Nandi had fully rehabilitated and was ready to start over as an independent wild white rhino. 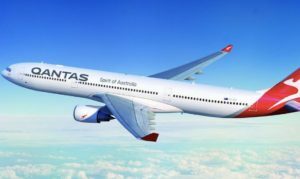 It was then that they finally released her back into the wild! It was a big deal, considering rescuers were initially unsure of whether this would ever be able to happen. Poor Mewie must have been devastated to lose his favorite gentle giant. 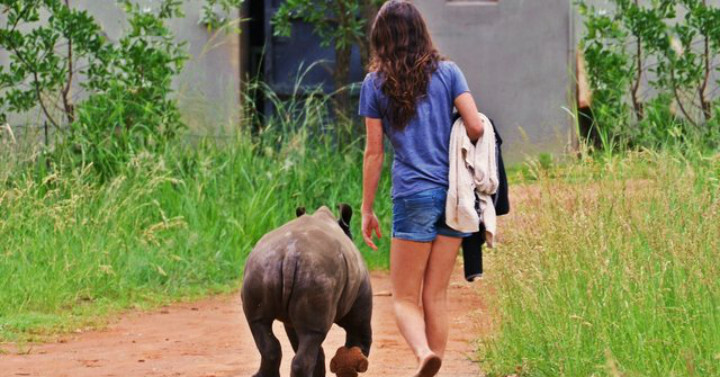 But no doubt, he will continue to befriend rescued rhinos that are brought to the orphanage. 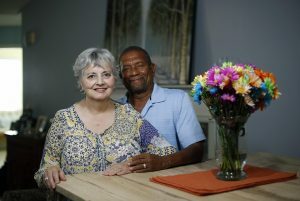 For those touched by Nandi’s story, it might be worth knowing her experience was more unique than one might expect. Nandi is far from the only rhino to have been sheltered by The Rhino Orphanage and, like Nandi, those other animals are rehabilitated too. But while human contact is necessary in the initial phases of saving a rhino and helping it regain its confidence, contact with the rhinos is very restricted in the later phases. Part of that is to prevent them from becoming too soft to be returned to the wild. Nandi’s trauma was so severe, though, that she required extra attention from staff. Now, some might be wondering how Nandi got into her dire predicament in the first place. 22. Why Was Nandi’s Mother Targeted? Nandi was left to fend for herself alone in the wild because her mother was attacked by poachers. But why did the poachers even attack her in the first place? What’s in it for them? The answer was, that it was all for her horns. 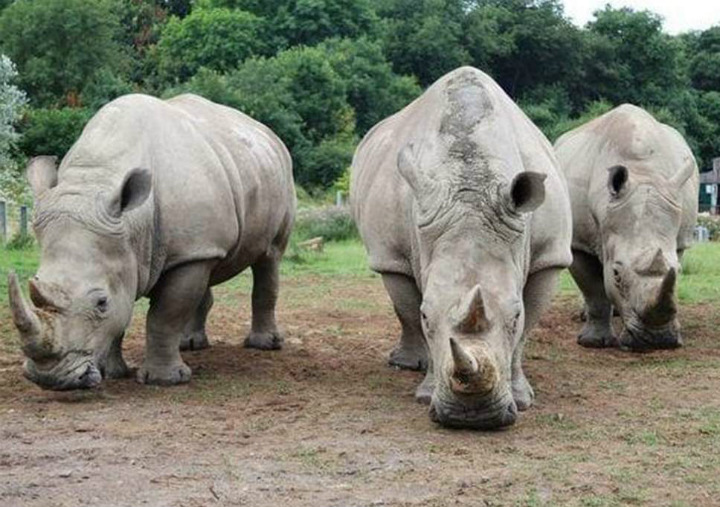 White rhinos have two horns, the foremost of which is larger than the other. White rhino horns have been known to grow up to five feet long, according to National Geographic. 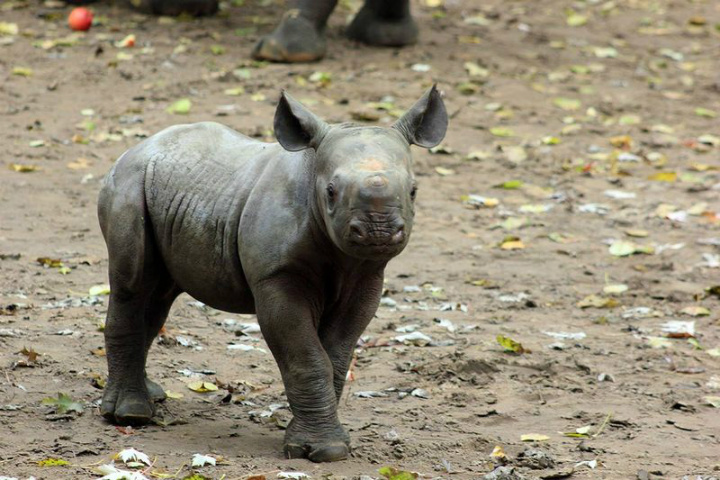 Rhino calves whose horns haven’t come in yet are often left alone by poachers, who prefer to go for fully grown rhinos. But why do poachers want the horns so badly? Though rhino poaching is, by definition, illegal, there are people who go to great lengths to obtain the horns of white rhinos. There’s a demand for white rhino horns in North Africa and the Middle East, as they are used as ornamental dagger handles; and in China, Taiwan, Hong Kong and Singapore because they are believed to have medicinal advantages. Unfortunately, Nandi’s mother was illegally targeted by the poachers because they knew they could make profits off her horns. It’s one of the biggest reasons young rhinos end up in Nandi’s situation. And what does this mean for the other white rhinos of Africa? The majestic white rhino has roamed much of sub-Saharan Africa for generations. Adult white rhinos generally stand up to five or six feet and weigh anywhere from about 3,000 to upward of 7,000 pounds. With no natural predators to worry about except humans, unfortunately, rhinos like Nandi are known for being “browsers.” That means they actually take their time looking for food, preferring the tastiest morsels around. 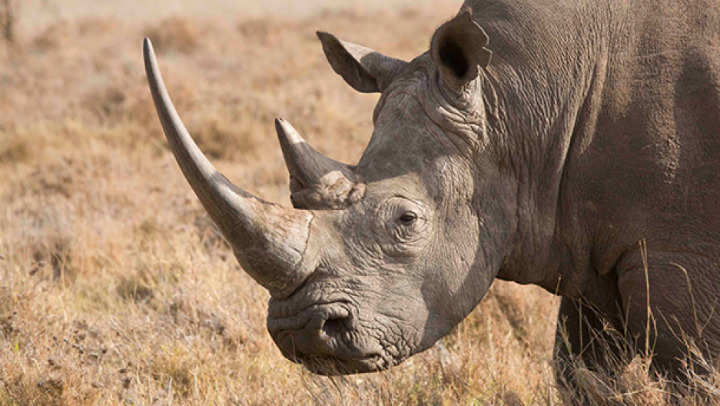 Most rhinos are solitary animals, but the white rhino is an exception, mostly moving in herds. 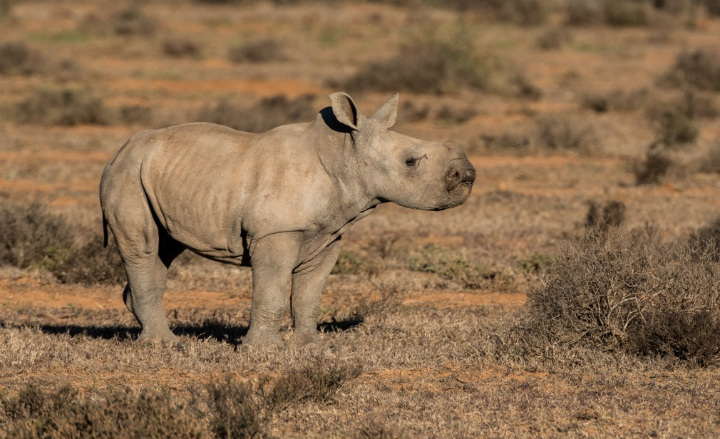 While this rhino species is found in South Africa today, their populations have faced constant threats due to poaching fueled by commercial gain. Although they were nearing extinction at the end of the 19th century, today the white rhino population boasts of some 20,000 in East and southern African, according to National Geographic. Still, to help ensure a future for the next generation, plenty of conversations efforts are still needed. While much of the world doesn’t reside anywhere near the native habitats of the white rhino—or any rhino species, for that matter—there are people who do, and many of them are determined to do whatever it takes to help prevent poaching and help rhinos at risk. 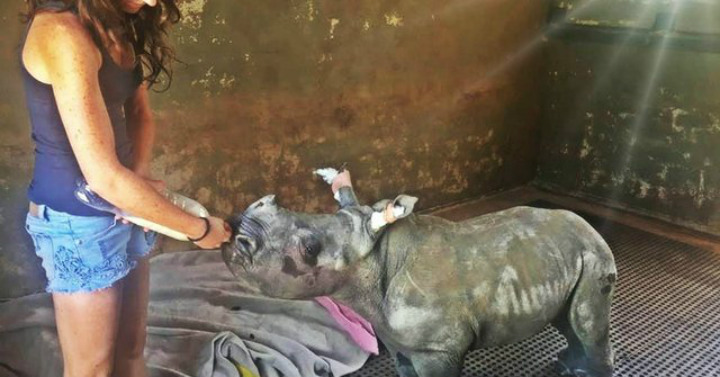 The Rhino Orphanage is unique in that it cares for orphaned and injured baby rhinos with the sole purpose of releasing them back into the wild, but it is far from the only organization that is working to protect the animals. 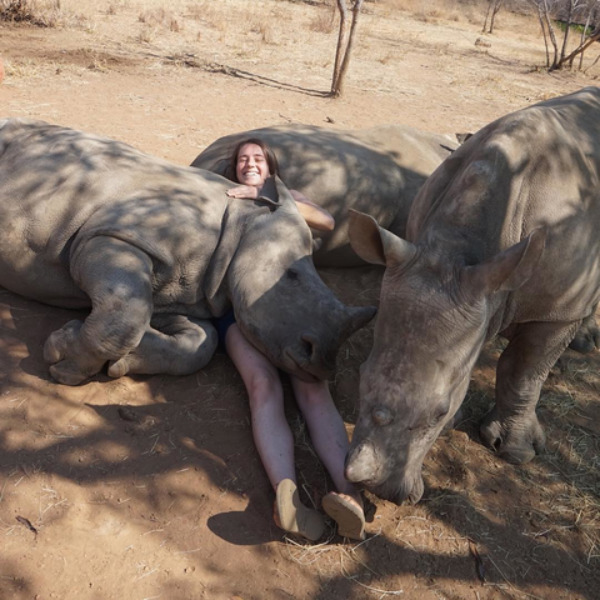 Such organizations are always looking for donations and volunteers to help rhinos just like Nandi, though cuddling with cats is not necessarily included in the job description.